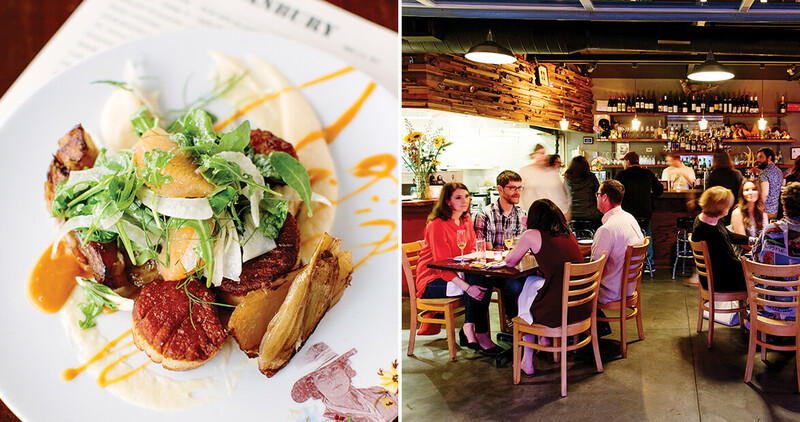 One of the most popular restaurants in Raleigh — and its adventurous, innovative menu — is tucked away in a quiet neighborhood, hidden in plain sight. There are signature dishes touched by the gods from award-winning chefs all over our capital city, but few places get it right every dish, every course, like Stanbury. The 15 small plates and five or six main courses on the nightly menu are surpassingly fresh, simple in concept, subtle in preparation, and served in a former laundromat-convenience store in Mordecai, a residential neighborhood that looks to be well on its way to sleep by 8 p.m.
You probably wouldn’t guess that the owners of the hottest restaurant in Raleigh were once purveyors of school-cafeteria Thursday Chicken Surprise at Warren Wilson College in Swannanoa, but that’s exactly how they got their start. At Warren Wilson, the students share in the labor of the campus — that’s the philosophy of the place. As freshmen, Joseph Jeffers and his brother Will were on kitchen duty. 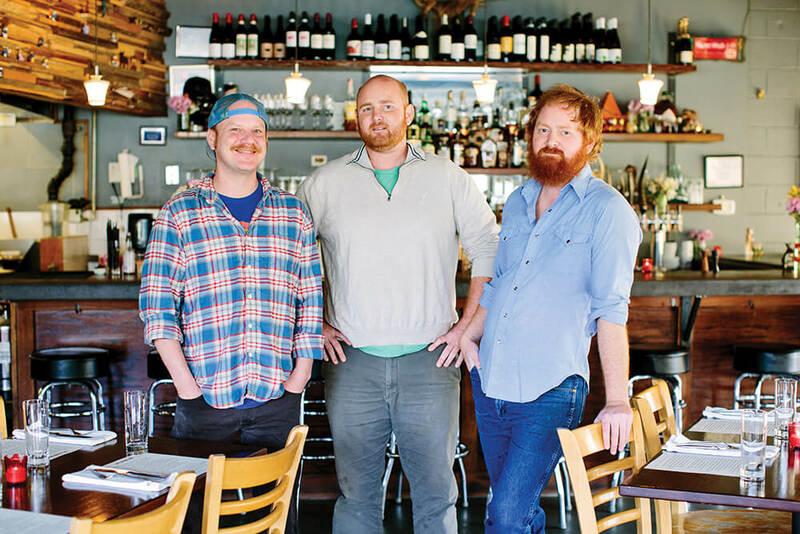 Their future partner in restaurateuring, Drew Maykuth, was in charge of vegetarian cuisine. Fortunately, that prediction didn’t come to pass. After college, Drew worked in restaurants in Tennessee and Ohio, and cooked on a yacht down in Belize, but became best known as the chef at The Admiral in Asheville, a dive bar turned gastropub. Facebook photos show him on his bass boat, or holding a butcher knife ready to prepare a calf. Some of the squirrels who made raids on his garden learned that he’s a good shot with an air rifle, too. Yes, bear. Drew, in return for some hauling, got ahold of some bear meat one hunting season. “You want to slow-cook bear,” Drew says, “in a Dutch oven.” Wine, shallots, a whole afternoon, and you have a perfect ragù. So an idea started taking shape. The two brothers were jacks-of-all-trades — farm work, horse farriers, salvage, construction, arborists, as if their Warren Wilson handyman days had never ended. Their friend could cook anything. Another friend, Andrew Shepherd, was also a kitchen veteran. Why not open their own restaurant? One spring morning in 2013, breakfasting at Market, the first restaurant on Stanbury’s site, the four of them — with dazzling speed — made a deal to buy the place. The commitment of the kitchen was a pledge to expand the capital city’s palate. No, not in the high-risk world of restaurant openings. But some of that haste gave Stanbury its unpretentious feel. It has the look of someone’s basement: cement-block walls, a few animal heads on the wall, yellowing portraits, and a porch accessed through an always-open garage door. No branding and no over-designed, overly clever menus, just a sheet featuring each night’s fare, straight from their copying machine. The commitment of the kitchen was not merely to farm-to-table, as fresh and good as you could get it, but also a pledge to expand the capital city’s palate. Stanbury invariably offers some classics: poached North Carolina shrimp, longing to be dipped in a chipotle mayo; scallops seared with parsnips in a grapefruit-vanilla emulsion (to die for); a miso dashi preparation of North Carolina striped bass; and oysters — raw as well as fried. For vegetarians, there’s always a gnocchi or tagliatelle — topped, on this outing, with braised cauliflower, pecorino, rapini, and rosemary cream. And for Uncle Frank, who just wants a steak, the grilled rib eye could put most steakhouses out of business. The kitchen fellows reckon it’s their best seller. But why would Uncle Frank want to eat the best steak he’s ever tasted? Stanbury can do raw. Last week it was steak tartare, tart with garlicky-sweet Vietnamese nuoc cham sauce and a mince of basil and cilantro; the next visit was lamb tartare spiced as one might have it in Morocco (if you go around eating raw things in Morocco, which I don’t recommend), tossed with cherry mustard and harissa, with a runny quail egg gluing it all together. Stanbury periodically does sweetbreads (if you don’t know what this is, best not ask), lightly fried; there’s tripe — sometimes savory Italian style, sometimes chilied-up Chinese style — and sometimes even brains. “Didn’t exactly fly off the shelf,” Joseph admits. There are also pig cheeks in a Mexican-inspired preparation. But if you are a true hog aficionado, if you claim to be a lifelong worshiper of all things swine, then perhaps the crispy pig head, a permanent menu item that’s served on a plate of bacon-braised lentils, is for you. And the pièce de résistance: marrow. A high-heat roasted femur or two is set before you with a narrow spoon and some slices of bread from Boulted Bread, one of the best bakeries in Raleigh. The oily, rich, beefy paste upon the warm, salty bread is last-request-worthy. In keeping with their non-highfalutin style, one of the trademark desserts in rotation is Krispy Kreme bread pudding. I am not one to say no to Krispy Kreme in any form, but I have become impressed with Stanbury’s array of chocolate desserts, made with the bean-to-bar chocolate of Escazu, right next door.